Family Record pages apparently removed at some point from the Family Bible of Henry M. Young and wives Charlotte E. (Curtis) Young and Zuba L. (Gilson) Young of Oswego County, New York. 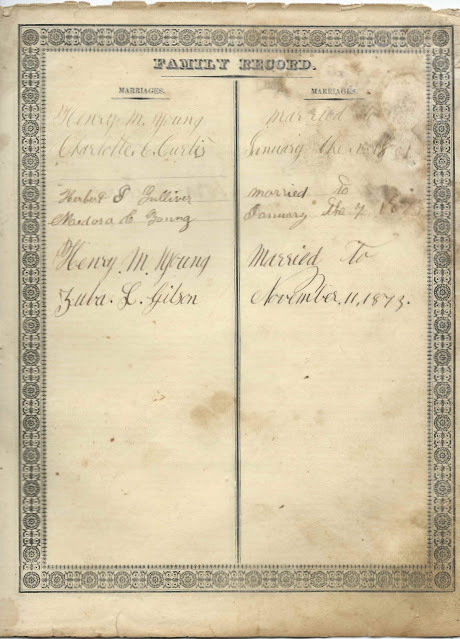 The page above lists Henry's marriages to Charlotte on January 2, 1851 and Zuba on November 11, 1873 and the marriage of Henry and Charlotte's daughter Medora C. Young to Herbert Gulliver on January 7, 1873. The page below lists the birth dates of Charlotte E. Curtis and her 9 siblings, plus the birth date of Charlotte's husband Henry M. Young. 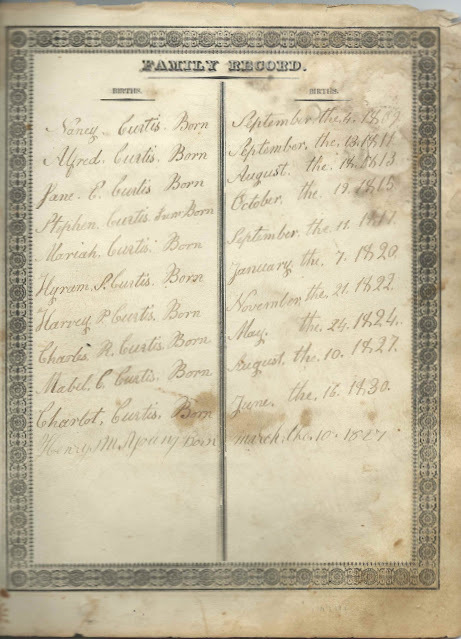 The Deaths page lists the deaths of Charlotte herself, her parents, some of her siblings and children; and the deaths of Henry M. Young and second wife Zuba. Dolly M. Curtis, [whose maiden name was, I believe, Loomis], Charlotte's mother; died August 12, 1858, Aged Sixty seven years and nine months. 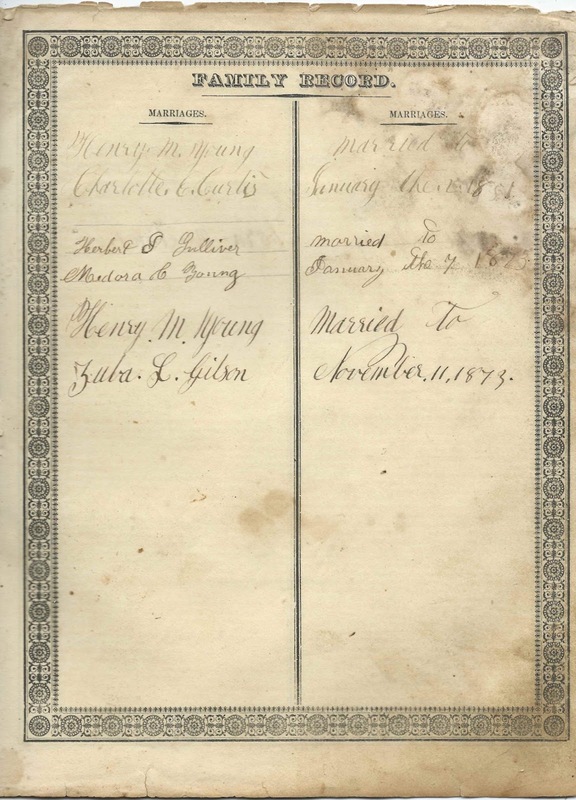 Henry M. Young, husband of Charlotte E. (Curtis) Young and Zuba L. (Gilson ?) Young; died August 29, 1907, 80 years. 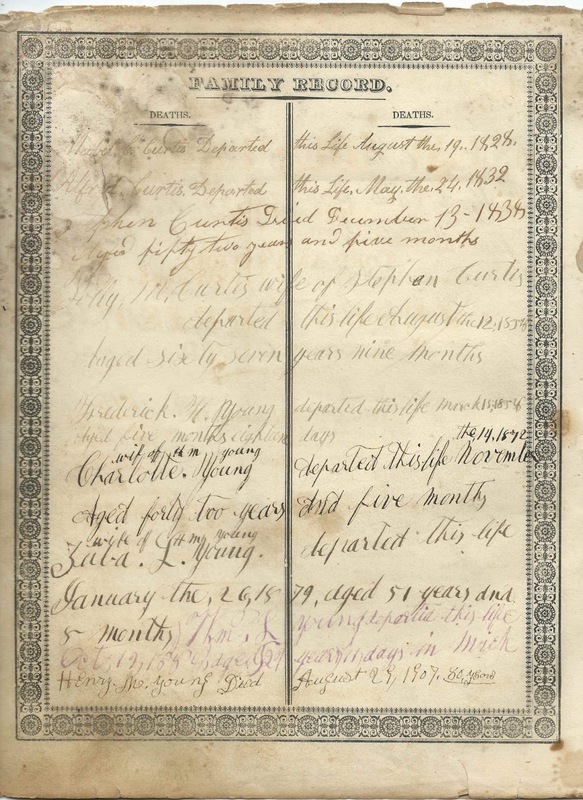 The pages do not mention any locales, but brief online research shows that Henry M. Young lived in Oswego County, at least part of his life at Scriba and part at New Haven. 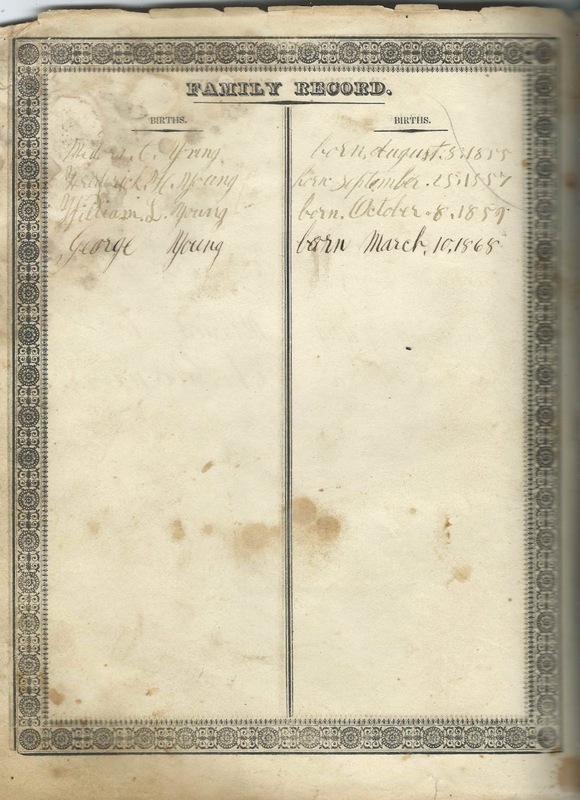 Zuba L. (Gilson) Young may have been the daughter of Simon and Phoebe (Kelsey) Gilson of Oswego County. If you have correction and/or additions to the information above, please leave a comment or contact me directly.